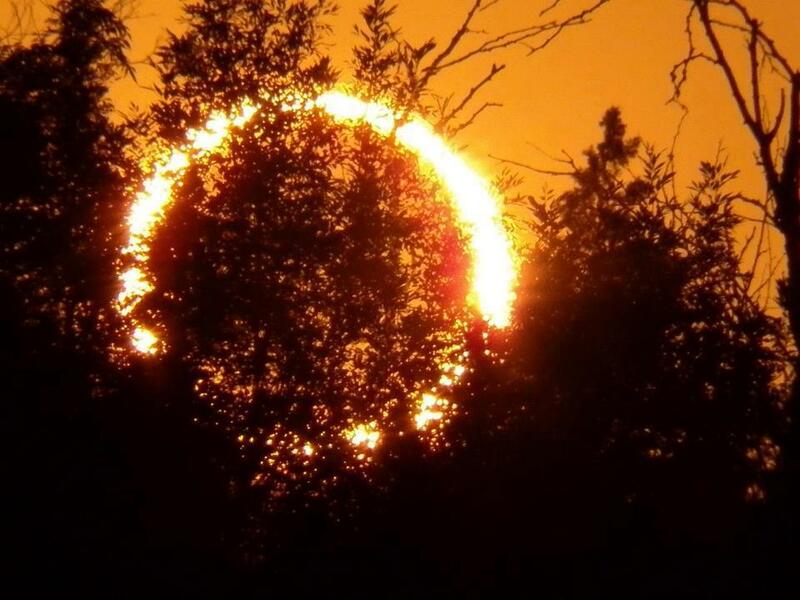 Ring of Fire, annular solar eclipse. I did not take this and do not know who did. It came across my Facebook page. All I know it that it was taken in Roswell, NM. I love how it was taken through the trees and appears no filter was used – the photographer may have dropped the exposure all the way down. Regardless, it is a phenomenal photo. Just about done. Glad you were able to watch it. I found a spot which wasn’t advertised and it was perfect! Awesome view and only about 20 of us total. Very nice. It’s no wonder early man, without benefit of science, imagined all sorts of terrifying explanations for events like this. Even when I know what’s happening, it’s pretty bizarre to have something as reliable as the sun doing something as unusual as this. Yes it would be. That’s how gods were made. Something had to cause this and science was not around. So the best they could come up with is what they know… human. But a normal human couldn’t do this, so they must be superhuman. Viola… gods. It really is a phenominal photo! Thanks for sharing. Yes it is. I love it.